Amos Goyne, Sr. married Mary Anne Baxter in Fairfield County in 1779. Their son Amos Goyne, Jr. was born there in 1780, and their son Jeremiah Goyne was born there in 1782. (Note: Jeremiah Goyne appeared to be close to Drury Goyen b. 1749’s family. He witnessed a land transaction in 1803 involving Isaac Going in 1803 and again in 1805 a transaction involving Job Going, Elijah Going and James Goyne – all children of Drury Goyen b. 1749. Jeremiah Goyne and James Goyne then appear in Robertson County, TN – see transactions below). 1806 Jan 25 – “Amos Gowen” was the addressee of a letter awaiting delivery in the post office at Nashville in a list which was published in the January 25, 1806 edition of the “Tennessee Gazette” published in Nashville. 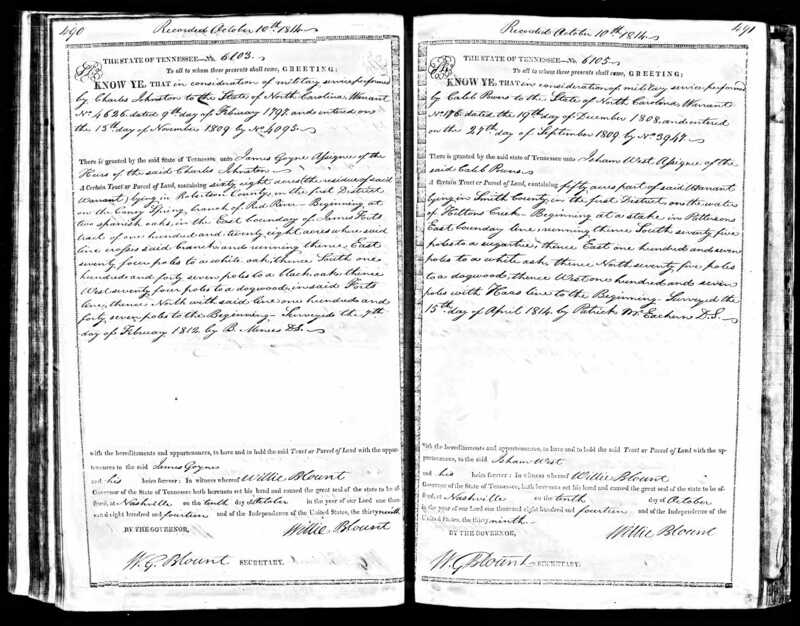 https://www.familysearch.org/ark:/61903/3:1:3Q9M-CS4X-K9XT-Q?i=272&cat=234586 (Note: Unknown if Jeremiah Goyne was any relation to James Goyne– such as a cousin or uncle, but worth checking – since same spelling, and appears to arrive about same time as James Goyne – best guess is that Amos Goyne Sr b. 1744 and Drury Goyen b. 1749 were brothers – both lived in Fairfield Co, SC area during Revolution – both married women with last name of Baxter – possibly sisters). 1809 Sept 12 – On September 12, 1809 “Amos Gowen” served on a jury panel, according to Sumner County court minutes. 1811 Dec 18 – Inventory of the amount of sales of the estate of Nicholas Conrad decd, James Goine is listed for $3.12.72. Will and Inv Bk 1, pg 410. Robertson Co, TN. 1812 – In the War of 1812, “Amos Goyne, sergeant,” served in the Tennessee Infantry under the command of Col. James Raulson and Capt. Mathew Neal, according to “Tennesseans in the War of 1812” by Byron and Samuel Sistler. 1812 Feb 7 survey – In consideration of Military service performed by Charles Johnson to the State of North Carolina warrant No 4626 dated Feb 9, 1797 and entered on Nov 13, 1809 by No 4095 is granted by the State of Tenn unto James Goyne assignee of the heirs of the said Charles Johnson a tract of land containing 68 acres (the residue of said warrant) in Robertson Co, TN on the Caney Spring Spring Branch of Red River bounded by James Forts line, surveyed on Feb 7, 1812, recorded Oct 10, 1814, bk L, pg 160. Robertson Co, TN (Note: Charles Johnson was a neighbor who shows up in Drury Goyen’s transactions back in South Carolina – this may be his son). 1814 Feb 14 On February 14, 1814, “Amos Goyne” bought Lot 17 in Cairo, Tennesseein Sumner County, according to “Sumner County, Tennessee Deed Abstracts, 1806-1817” by Joyce Martin Murray. 1814 Feb 14 – Amos Goyne from William Smith deed, lot no 17 in Cairo, Deed bk 6, p 436. Sumner Co, TN. William Smith to Amos Goyne for a lot in Cairo No 17, … for $100 paid by Amos Goyne of Sumner Co, TN, … I convey to the said Amos Goyne … all that lot of land …. in Town of Cairo and distinguished in the plan of said town by number 17 situate on the West side of Oak Street … Signed: W. Smith. Wit: Jacob C Cook, William Goodall. 1814 Dec 28 to March 1815 – “Amos Goins, private,” was listed on the payroll of a company of Louisiana Militia commanded by Capt. William Watson of the 12th and 13th Consolidated Regiments in the service of the United States. His service was for the period: 28 December 1814 to March 1815, according to “Louisiana Genealogical Register,” Vol. 3. Amos Goyne, Sergeant is listed in 3 Regt (Roulston’s) West Tennessee Mil. General Index Card. brother Jeremiah Goyne is listed on the next page in Cheatham’s Detachment, Mtd. Infantry, Tennessee Militia War of 1812. Comments: Lwr: If he cannot obtain a warrant for his services, it will be one of those hard cases; and where loss fall most heavily, he being very poor, as well as an ignorant old man, who does not appear to retain his memory as well as the uneducated do generally. 1816 Jan 29 – Amos Gowan from Alexander Graham deed, for $100 Alexander Graham conveys lot no 15 in Cairo, Sumner Co, TN, on West side of Oak Street … Signed: Alexander Graham. Wit: John Brown, John Hamilton. Deed bk 8, p 40. Sumner Co, TN. 1816 Sept: (Note fr researcher: Jeremiah Goyne and his half brother, James Byrns were in Robertson County by 1807. Jeremiah married but I have never been able to determine his wife’s name). The minutes of Red River Baptist Church [near the present site of Adams, Tennessee] for September 1816 state that “Brother and Sister J. Goyne were dismissed by letter.” (Note: I know nothing of them after that date). 1818 Jan 3 – Amos Goyne to Samuel Lockhart deed bk 8, p 221. Sumner Co, TN. … Amos Goyne is paid $600 by Samuel Lockhart for a deed of a lot in Cairo … conveying Lot No 17 in Cairo … on West side of Oak Street… Signed: Amos Goyne.Wit: John Brown, Wm Herndon. Sumner Co, TN. 1818 Sept 21 – Amos Goyne from Robert M Boyers etal, deed, lot, 3, bk 8, p 414. … Robert Boyers and Nathaniel Prince … to Amos Goyne .. all of Sumner Co, TN … Amos Goyne paid $690 dollars … a lot in the Town of Gallatin, TN, being a part of lot No 1 in the SW square of said Town … coming 87 and 1/2 feet from the NE corner of said lott .. along Water Street … Signed: Boyers and Prince. WIt: Mason Avent. William Prince. It is believed that he was married to Sophia Brashears about 1816, perhaps as her second husband. “Amos D. Gowen” received a military warrant for land in Rapides Parish. Later this warrant was purchased by Hiram D. Goyne, assumed to be a distant cousin. 1820 US Census – “Amos Goines” was enumerated in the 1820 United States census of Rapides Parish, Louisiana, living on Bayou Boeuf.